Since the last two weeks the political struggle for the presidential chair in Kyrgyzstan has intensified significantly. All the candidates "moved" from the capital to the regions. The candidates intensified the propaganda, facing threats, insult, spoiling even evil eye. Ferghana.Ru continues the monitoring of election campaign in the republic. Comparing the agitation messages, distributed by the opponents of the president on the one hand, and his supporters on the other hand, one can have the impression that they live in two different countries. Pro-president mass media report the support of Bakiev throughout the country. 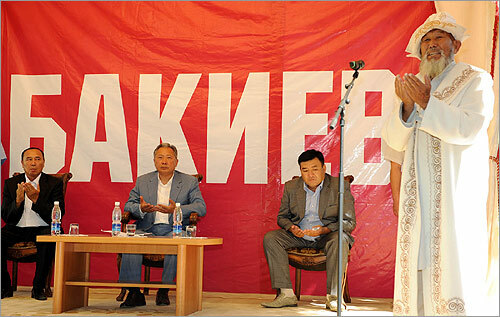 "The voters in Uzgen rayon highly value the achievements of Kurmanbek Bakiev. Thanks to his efforts, it became possible to re-launch the industrial and energy units that have been stagnant since the collapse of USSR", the resident of local village underlined. "Thanks to President Bakiev many women were able to take1/3 of seats in Jogorku Kenesh. They also head the Constitutional and Supreme courts". In their turn, the opposition leaders demonstrate total confidence in the successful outcome of elections. They posted the articles in Russian and Ukrainian internet agencies, saying that Kurmanbek Bakiev is losing election campaign and the population supports his political opponents. For example, Bakyt Beshimov, the head of election office of Almazbek Atambaev, shared with Komsomolskaya Pravda in Kyrgyzstan: "Today, we are winning in all the regions. We win not by screaming. We win by smile. We win by hopes. We win by faith in the power of Good". It is hard to give true estimate on what is really going on. Nobody carried out the independent sociological surveys. Politically committed sociologists publish contrary materials. Thus, last month pro-president mass media reported that results of sociological review, conducted by local companies and indicating that vast majority of Kyrgyz citizens support current president. Several weeks later, the team of Atambaev published the result of sociological survey, conducted by some Russian Center for Political and Social Research and indicating that Atambaev is an absolute (60-80%) leader in northern Kyrgyzstan while the positions of Atambaev and current president are equal in the south of the republic. It has to be mentioned that this information was posted only opposition web-sites and the number of secondary foreign media. Moreover, Ferghana.Ru journalist could never find any information on Russian Center for Political and Social Research. The current President Kurmanbek Bakiev has been the most active candidate: he managed to visit each region of the country. It is interesting to note that all regional trips of Bakiev are accompanied by the opening of plants, factories and schools. According to press-service of the President, on July 3, Bakiev attended the 4th congress of livestock breeders and the launch of polysilicon producing plant in Jalal-Abad oblast. Besides, Akipress news agency reports that "the President participated the opening of sports center and Keremet recreational resort. He also attended the ceremony of putting the first stone in the basis of Kara-Kuldja small hydropower plant". 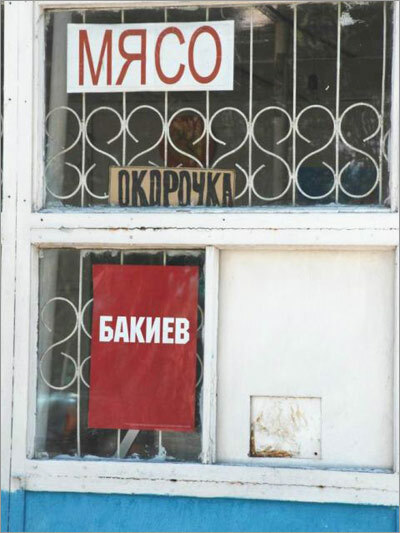 The agitation materials of Bakiev still dominate in Bishkek and regions. 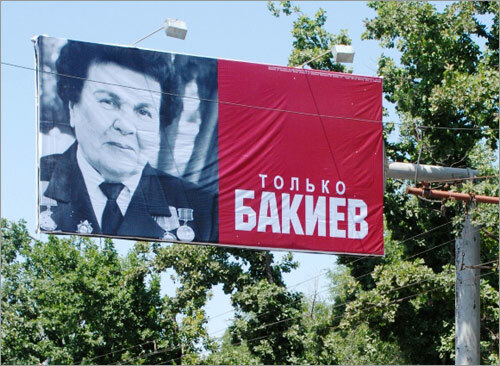 Red posters with the last name of current president and big banners with unknown citizens (assumingly, businessmen, doctors, teachers and etc) ask to vote for Bakiev. There are many posters on the regional highways. 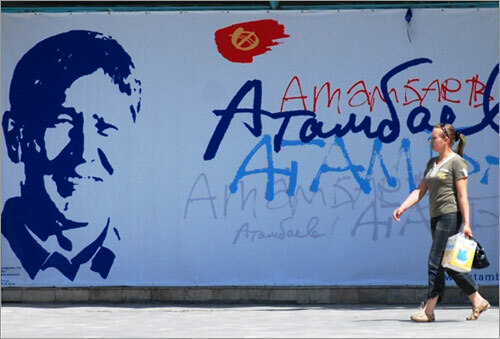 Almazbek Atambaev, the single candidate from united opposition forces, has also been active on the promotion side. He visited the north and the south of the republic. Nonetheless, he preferred not using billboards. One of the articles, posted at the web-site of Socio-Democratic Party, says the following: "The experts observe new methods, applied by opposition forces, and great ideological work. Comparing to simple slogans of presidential office, the opposition election technologies are distinguished by modern and convincing style". Meanwhile, against all norms of Russian language, the opposition party continues using comma in the election slogan "Together, we can do it!" On the background of leading candidates, the promotion of other candidates is quite weak. Only Jenishbek Nazaraliev’s election campaign deserves some attention. 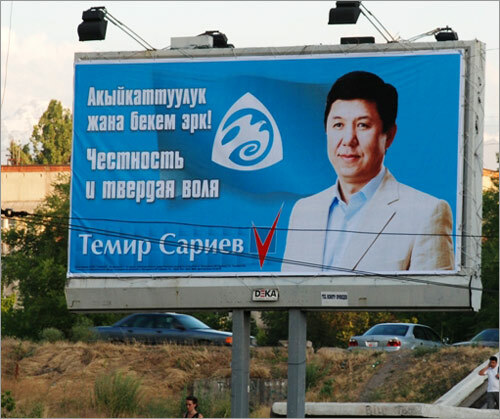 Temir Sariev rented out few billboards in the center of Bishkek. 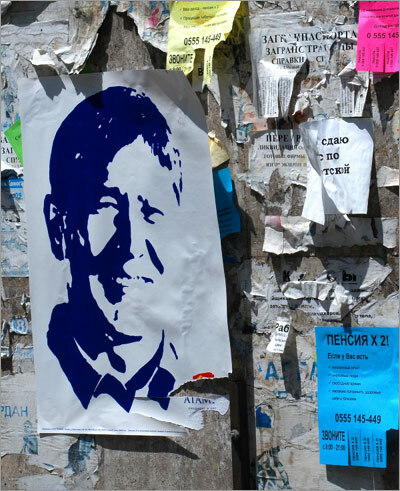 The handouts with his portrait can be noticed at some streets of Bishkek. Nurlan Motuev and Toktayim Umetalieva are outsiders of this race. They barely have any promotion plan. It is interesting to note that all candidates, except for Bakiev and Motuev (who noted that he supports current President) constantly report that some forces try "to stop them". Under the pressure of unknown people Temir Sariev was forced out from one of regional centers. The electricity supply was cut at one of the cities during the presentation of Nazaraliev. 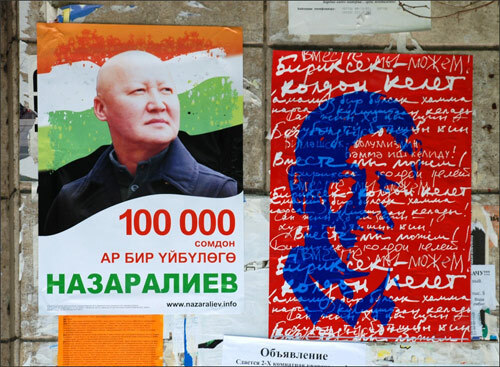 Some of Atambaev’s meetings with voters were cancelled. Nearly all such incidents are related to the fact that local and central government hinders the promotion of other candidates. Local mass media still continue ignoring opposition candidates. Nearly all TV channels, radio stations and press prefer to cover the activity of current president. According to OSCE center for election monitoring, the National television and radio (NTR), El TR (sponsored by the government), privately-owned NTS and Channel 5 predominantly covered the campaign of current president. President Bakiev received 60 percent of news coverage at NTR and 80 percent at El TR. The same situation was observed at Channel 5, where about 78 percent of news block was dedicated to Bakiev. "The coverage of Bakiev’s campaign was quite positive at all channels. The same channels provided 7-12 percent of news time to Atambaev with negative or neutral content. 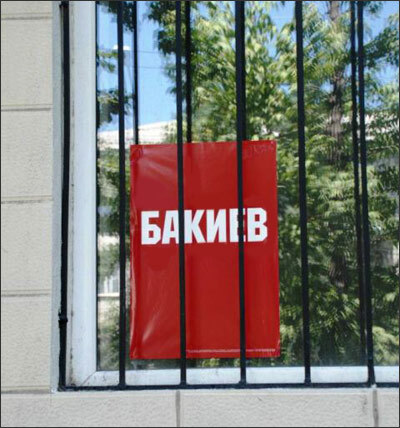 Privately-owned NTS allocated 99 percent of time to cover Bakiev’s campaign and ignored other candidates". The number of Internet mass media and Azattyk (Kyrgyz service of Liberty Radio) radio station remain relatively independent. Main critical articles about Bakiev are being published in small and less popular local opposition press and foreign mass media. Central Election Committee of Kyrgyzstan continues the accreditation of international observers. As of July 15, it registered 430 international observers. The local organizations are planning to attract about 19000 observers. CEC is running "Attend and vote" campaign throughout the country with the purpose to increase the attendance. The concert of local starts already took place in Jalal-Abad and Osh oblasts. On June 15 the concert was organized in Bishkek. The local music stars are also going to visiting Naryn, Issyk-Kul and Talas oblasts. The local analysts are not willing to talk about elections. Most of them openly declare confidence in the victory of Kurmanbek Bakiev; Atambaev is going to take second position, losing 25-30% of votes. 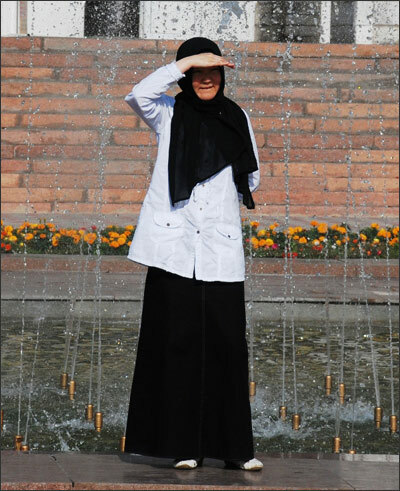 The only female candidate Toktayim Umetaliev is predicted to have least number of votes. In the opinion of political scientist Marat Kazakpaev, the opposition forces managed to combine efforts and effective run election campaign. At the same time, he pointed out insufficient work with non-governmental organizations and mass media. Kazakpaev believes that administrative mechanism is going to be applied during the elections since Kurmanbek Bakiev and his team "will do their best to remain in power". According to the expert Marat Suyunbaev, he does not trust much any of the presidential candidates. Speaking of candidates, Suyunbaev mentioned famous Kyrgyz proverb "All girls are good. Where are bad wives coming from?" The opposition members made few scandals, blaming the government in the attempt to liquidate the political opposition; specifically, they mentioned the poisoning of Almazbek Atambaev by convulsant/nerve gas as well as kidnapping of one of UPM members. The current regime has not responded yet, but one can expect that the official will just ignore the blames or will totally reject them. According to Ferghana.Ru sources, the government is putting efforts to prevent "Moldova case" in Bishkek. The government-controlled mass media issue negative coverage of the events in Moldova, hinting on their possible impact on Kyrgyz Republic. The opposition leaders also announced the readiness to organize protest demonstration. 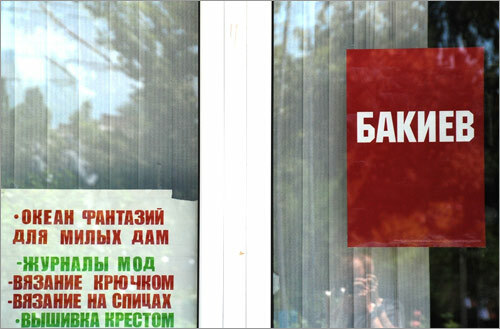 The election office of Almazbek Atambaev called the supporters to stay the entire day in front of the polling stations "to make sure their votes are not stolen".